Looking for ecommerce design ideas? Browse through website galleries that showcase ecommerce sites. Find examples of beautiful websites and site elements from both new and established ecommerce stores. Here is a list of inspirational galleries that showcase ecommerce sites. There are galleries curated by website designers, as well as galleries judged by users. Most of these galleries are open to submission. 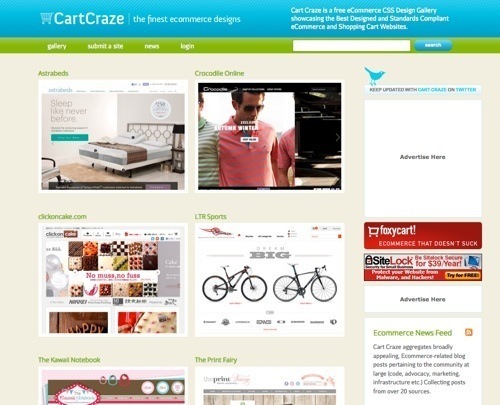 Cart Craze is a gallery showcasing well-designed ecommerce and shopping cart websites. It evaluates and hand selects ecommerce websites based on the following criteria: respect to standards’ compliance, CSS programming, coolness, and overall attractiveness. 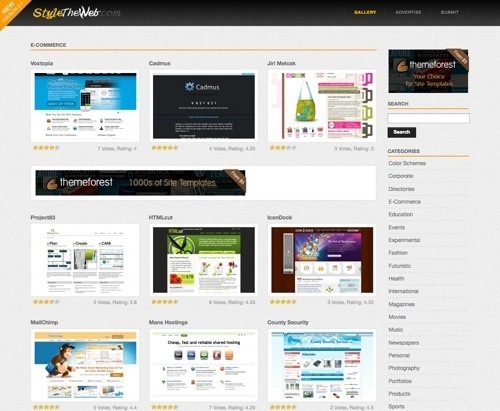 Check out the collection of top rated ecommerce sites, scored by user votes. The gallery is open to submission. Only web sites with shopping carts and visually appealing designs should be submitted. 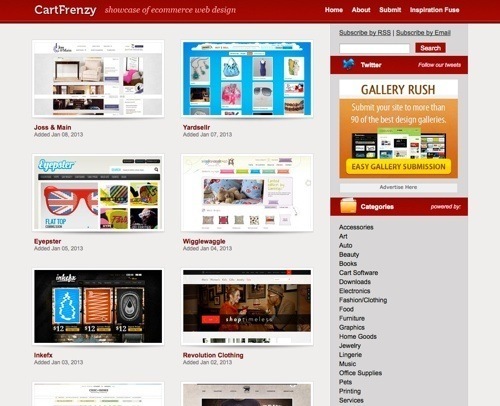 CartFrenzy is a gallery that showcases well-designed ecommerce and shopping websites. The purpose of CartFrenzy is to provide design inspiration for those who are creating ecommerce sites. It has a diverse collection of over one thousand sites. Search ecommerce categories, like furniture, beauty and toys. CartFrenzy is by Vandelay Website Design. The gallery is open to submission. 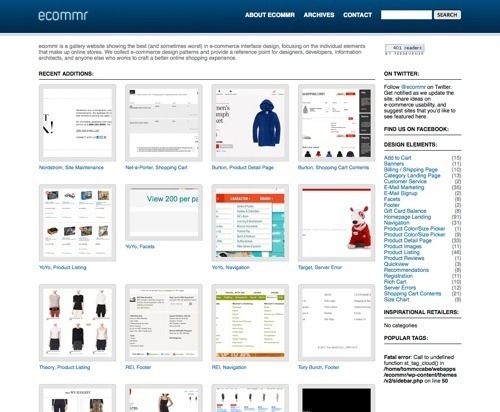 ecommr is a gallery website showcasing the best and worst in ecommerce interface design. This gallery focuses on the individual elements that make up online stores, such as banners, size charts, and product listings. It collects ecommerce design patterns and provides a reference point for designers, developers, and anyone else working with the online shopping experience. Find inspirational design elements for sections of your own site. ecommr is the work of Tom Sullivan, an ecommerce web developer. 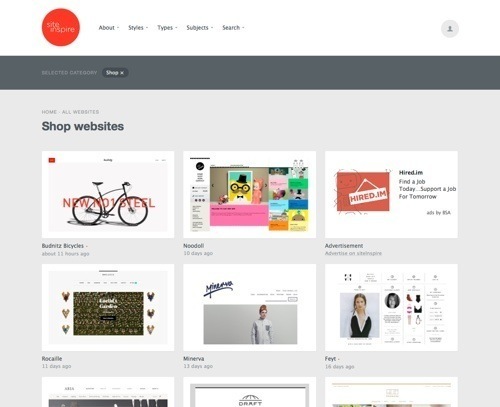 siteInspire lets you browse over 2,600 websites by style, type or subject. siteInspire was started primarily as a tool to keep track of web design trends and inspirational sites. Search the shop category or the many other category tags to identify inspirational design elements. Websites are chosen and curated by Howells—Studio, a web design and development studio. Sign up to submit sites for consideration. PatternTap highlights the nitty-gritty of great design and interaction work to over 25,0000 registered users. The ecommerce section contains over 100 shops contributed by the site’s users. Examples range from individual site elements to full pages. 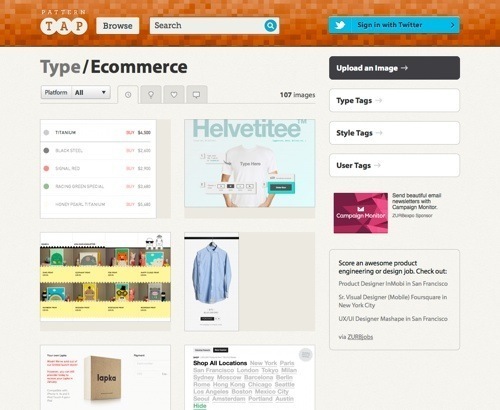 Search by type, style and user tag. Browse most recent, good ideas, great visual design and most comments. Sign up to submit sites for consideration. StyleTheWeb is a categorized CSS gallery for design inspiration. It has a nice selection of ecommerce sites, which viewers can vote on. The gallery is open to submission. 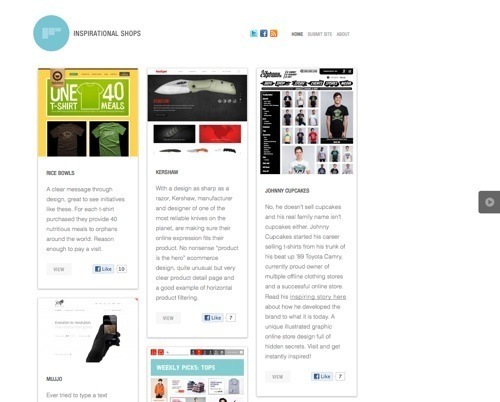 Inspirational Shops is by Jasper de Ridder, an ecommerce designer and developer. The site seeks to showcase stunning site designs and trends — not only to inspire designers, but also so ecommerce storeowners can see the biggest brands. The gallery is open to submission. 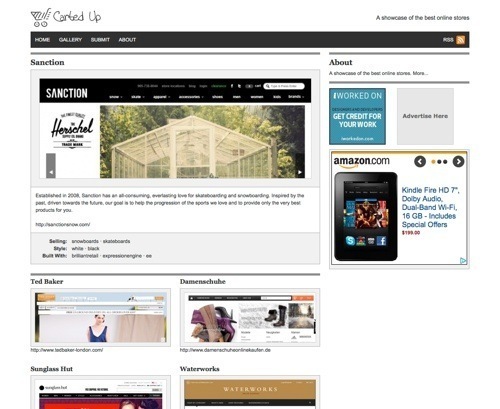 Carted Up is a showcase of online stores that are beautifully designed and easy to operate. It prefers stores built to web standards, but doesn’t exclude sites if they are not. Browse by commerce tags, style tags, and carts. Top commerce tags include clothing, toys, art, baby, skincare, and accessories. The gallery is open to submission.